The Saints have been a high-scoring offense for quite some time, and Brees (1410 passing yards, 10 TD, 4 INT) was disappointed they didn’t score more points in last Sunday’s win at Jacksonville. He said afterwards had someone told him New Orleans would muster more than 500 yards of offense, he would have thought the score would have been even more lopsided than 13 points. 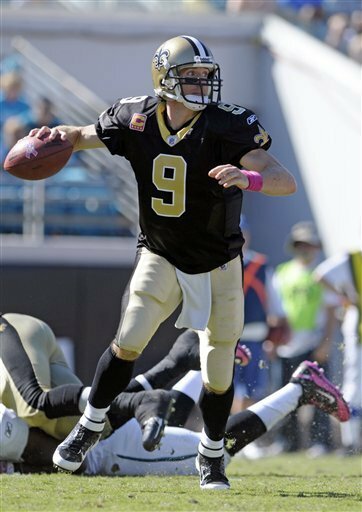 Brees alluded to the fact the Saints were inside the Jags’ 20-yard line three times in the second half and failed to score a touchdown. Brees has thrown a touchdown pass in 31 straight games and broke a tie with Dan Marino for the third-longest streak in NFL annals with last week’s performance. Johnny Unitas holds the NFL record of 47 and Brett Favre is second with 36 consecutive games with a touchdown strike. Brees has also posted at least 20 completions in 24 games in a row, the longest streak in league history, and owns 40 games of 300 or more passing yards as a Saint. Wide receiver Marques Colston (7 receptions) returned from a two-game absence due to a shoulder injury last week, but had just one catch for eight yards. Sproles (26 receptions, 1 TD) led the team’s aerial attack with 75 yards on seven catches and tops the Saints in receptions. Rookie running back Mark Ingram (184 rushing yards, 1 TD) posted a career-best 55 yards on 17 touches for the Saints, whose offensive line played without center Olin Kreutz and right tackle Zach Strief last week. Carolina should expect Brees and the Saints to air it out this weekend and is currently sixth against the pass, allowing 203 yards per game. The Panthers were burned by Bears running back Matt Forte, who had 205 yards rushing last week, but held Chicago to nine completed passes and 93 net yards passing. The nine completions are the fourth-fewest given up in team history. Veteran cornerback Chris Gamble (5 tackles) did not travel to Chicago last week because of a concussion suffered against Jacksonville the previous Sunday, and is hoping to get back onto the field this weekend. Darius Butler (7 tackles) will most likely get the start if Gamble is unable to go, and Rivera has been impressed with the former’s cover skills and aggressiveness. Butler will need to use his talents with the pass-happy Saints coming to town. The Panthers made a move this week by claiming safety Jermale Hines off of waivers from Indianapolis and releasing safety Sean Considine. Defensive end Charles Johnson (13 tackles), who signed a big deal in the offseason, has a sack in four straight games and 12 in his last 11 outing. He posted a career-best 11 1/2 sacks in 2010. The Panthers have proven they can throw the ball around, averaging 334.8 passing yards per game right now, but running the football has been an area of concern. They are 17th in the league in rushing and backs DeAngelo Williams and Jonathan Stewart haven’t lived up to their standards. Williams (143 rushing yards) leads the Panthers with 37 carries and Newton is second with 33 for 133 yards. Stewart (142 rushing yards) and Williams are both healthy, and also part of the reason why Carolina notched a franchise-best 543 yards of total offense against the Bears. The Panthers posted a season-high 169 yards rushing on Chicago as well and have gained at least 400 total yards three times in 2011. Newton (1,386 passing yards, 5 TD, 5 INT) has been progressing at a quick rate and seems to enjoy throwing to wideout Steve Smith as much as possible. The Saints are in the middle of the pack against the pass, while Smith (24 receptions, 530 yards, 2 TD) looks to add to his team-high reception total this season. He became the Panthers’ all-time leading receiver with 9,414 yards, surpassing the 9,255 yards by Muhsin Muhammad, in last week’s loss, and finished the game with a team-high eight catches for 181 yards to post his third 100-yard receiving performance this season. Tight end Jeremy Shockey (178 yards), a former Saint, is dealing with a concussion and questionable for Sunday. Payton said during his Monday conference that Newton is similar to Steelers quarterback Ben Roethlisberger or Tampa Bay’s Josh Freeman because of his size and ability to avoid the sack. He added Newton’s speed and arm strength will give defenses fits and that he isn’t afraid to take off in tight coverage. As previously noted, the Saints hassled Gabbert into many errant throws and sacked the first-round draft pick three times, two of which were by veteran defensive end Will Smith (8 tackles), who now has 12 multi-sack performances in his career and should be ready for an even tougher challenge this week. The Saints, who became the first NFC South team to win in Jacksonville (1-8) last week, held the Jaguars to 274 total yards in one of the defense’s best showings of the year. The Saints are ninth against the run, 15th in yards allowed, 19th in pass defense and 20th in points surrendered through four weeks of action. Leading tackler and strong safety Roman Harper (31 tackles) posted his team- leading fourth sack of the season last Sunday and finished with eight stops. Carolina’s ground attack is nothing to fret over, but its passing game may cause problems. Saints corners Jabari Greer (19 tackles) and Tracy Porter (7 tackles) will be busy. The Saints will win if Brees is given enough time to pick apart the defense. Teams have been able to get their licks on the standout quarterback, as Brees has picked himself off of the turf nine times this season, including five in the past two weeks, and Carolina needs to mount a rush to keep him at bay. Brees has won three straight meetings with the Panthers and is 8-3 in his last 11 starts against teams from the NFC South. 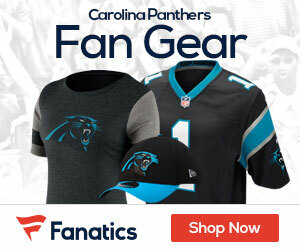 Can Newton and the Panthers match the Saints’ high-powered offense in front of the home crowd? Newton has been lights-out in each of his first four starts and gives his team a glimmer of hope when it comes to winning. Rivera mentioned if the team can match Newton’s growth, then bright moments will follow. The running game must follow suit to avoid making Newton a one-man gang. Special teams and run defense killed Carolina in the Windy City last week, with Forte running wild and Devin Hester returning a punt for a touchdown. For the Panthers’ sake, the coaching staff will have to make the proper adjustments for the visiting Saints.